Callender Cable and Construction Co Ltd, Erith, London. (Note – SBH – I have created a page for this company on my website as Graces Guide, infers it had connections with Falkirk, Scotland. However I cannot confirm whether this was a manufacturing site or perhaps a sales outlet. 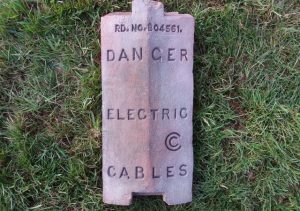 Further I cannot confirm 100% whether the company manufactured terracotta electricity cable covers or had them manufactured by a separate company and stamped with the Callender name. Bricks have also been found stamped ‘Callender’) – further research and clarification is required. From research by Ian Suddaby, we believe this CC trademark stands for Callenders Cable & Construction Ltd which appaently had connections in Falkirk, Scotland, this firm started life as Callenders Bitumen Telegraph and Waterproof Co Ltd. but the name changed in the 1890s. They made cables at a plant in Erith near London from the later 1890s and formed part of BICC in 1945. It is possible the company sourced the making of the clay covers out to various companies however it is not certain where they were made. 29/07/1896 – London Evening Standard – New Companies – Callender’s Cable and Construction Company Limited. Found Guardbridge, Fife. Callender Cable and Construction Co Ltd, Erith, London. Terracotta electric cable cover Danger Regd no 804561 CC Electric. 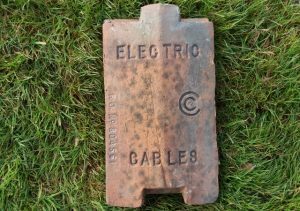 . . Below – a Callender Electric brick or indeed a variation on an electric cable cover. Found Guardbridge, Fife Callender Cable and Construction Co Ltd, Erith, London. Terracotta electric cable cover Danger Regd no 804561 CC Electric. 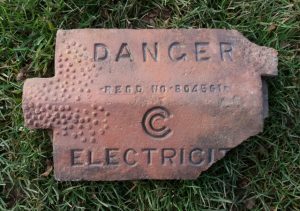 . . Below – Electricity covers found by Brian Wardle in Northumbria. This appears to be a Callenders Cable & Construction Ltd product but without the trademark being stamped.